Lauren Herzak-Bauman makes sculptures, installations, and public art that explore the dynamic relationships between memory, nature, and loss. 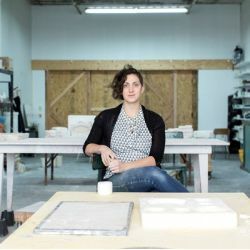 Born and raised in Northeast Ohio, she studied ceramics at The University of Minnesota-Twin Cities (MFA 2009) and Bowling Green State University (BFA 2004). Lauren is the recipient of two Minnesota State Arts Board Artist Initiative Grants, the Minneapolis College of Art and Design Jerome Emerging Artist Fellowship, and was named a 2016 Creative Workforce Fellow. Recent exhibitions include "Somewhere Between" at Gallery W in Westlake, Ohio, and "The Ceramics Show" at Corey Daniels Gallery in Wells, Maine. Lauren's latest public art piece, Common Energy, is on display at Cleveland Public Library's Eastman Reading Garden. Lauren lives and makes art in Lakewood, Ohio.